"The Expert Game" by Terence Reese was last published in 1984 and has now been revised and updated by Barry Rigal. This is an enlarged edition of the original title by Terence Reese which provides advice about higher level modern bridge theory and includes new information about recent developments in bidding and playing practices. "The Drawing of Trumps and Its Postponement" by Fred Karpin explains when it's best for declarer to draw trumps and when it's best to leave it for a while (or never). Sometimes you need to set up a side-suit first, or perhaps ruff something first, or maybe it's a simple cross-ruff hand. "Bridge Conventions in Depth" is an excellent conventions book for the advanced-expert player. Matthew and Pamela Granovetter discuss many interesting topics such as Last Train, vacant doubletons, double keycard Blackwood, the trump cuebid, undercalls over 1♣ and the Yellow Rose of Texas. This really is another 'wow' book. "Duplicate Pairs for You" by Andrew Kambites explains the tactics employed in good duplicate pairs - why the bidding is highly competitive and why overtricks are at a premium. This text should enable any competent bridge player to play duplicate with confidence - and success. Hubert Phillips was the founder and editor (1932-9) of the British Bridge World, and a pioneer of bridge organisation in England, captaining England in 1937 and 1938. "Brush Up Your Bridge" is not for the beginner, but is designed to fortify the technical knowledge of those who already play the game. 119 pages with twenty-five drawings by Ward. - Vol 1 For Beginning Players: Ten lessons cover basic vocabulary, opening notrump bids and responses, opening suit bids and responses, scoring, opening leads, competitive bidding, slam bidding, opening bids of more than one of a suit. Books on bridge bidding, like some wines, do not travel at all well. But books on play are another matter, and there have been several excellent ones from Australia. 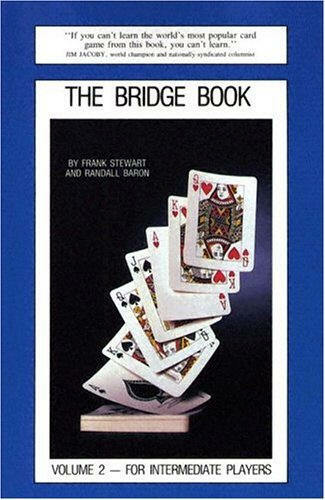 Two such books are "Problems in Play: First Book of bridge problems " and its sequel. The author, Denis Priest, is a professor of botany, and he collects interesting specimens in the countryside and at the bridge table with equal enthusiasm. Each book contains 100 single-dummy problems. Here is an extract from the first book: East has opened four spades, showing a suit of at least seven cards, and West leads the spade jack. South covers with the spade queen, for he does not want West to win the trick and shifts to diamonds. East wins with the king and shifts, perhaps to the club seven. South wins in his hand (although that is not essential) and leads a trump to dummy. A second round becomes unnecessary, so he ruffs a spade and leads to the club king. Now South resorts to a loser-on-loser play. He leads the spade ten from dummy and throws his club loser when East covers with the ace. The declarer hopes that East has no more clubs to lead, and his plan works. East has no more clubs, so he is end-played: Whether he leads a diamond or gives a ruff-and-sluff by playing a spade, South avoids the loss of a diamond trick and makes his contract. If East is able to produce a club after winning the spade ace, South can ruff and fall back on the diamond finesse. If this fails, he can at least take comfort in the fact that he gave himself every possible chance. This is one particular area of bridge that occurs once every hand, is specifically your problem to deal with 25% of the time, and the title of the book is a dead give-away as to what we are talking about. Since we don't get to see dummy until we have made our best guess at the opening lead, we either need to pull the right card, or have a very understanding partner. "Your Lead, Partner" Ben Cohen and Rhoda Barrow covers all of the situations you are going to encounter, briefly. There are massive volumes out there dealing with just this subject, some of them so specific as to require patience to find the right chapter.This book really is an excellent compromise between convenience and comprehensiveness, and is recommended to players who want to understand how to better unravel the mysteries of picking the right card at trick 1. "All You Need to Know About Bidding" by David Bird and Terence Reese is obviously a somewhat brazen title, but it does contain a lot of bidding theory. The sequel "All You Need to Know About Play " provides further guidance for bridge-players, covering play techniques without which many makeable contracts would be foregone by declarer, illuminating opportunities in defence that are easily missed, and includes a summary of conventions in play.